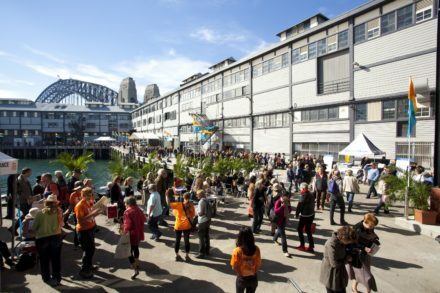 Walsh Bay Arts Precinct is a much-loved Sydney destination and home to some of Australia’s leading performing arts companies. Due for completion in 2020, the redevelopment will boost an already dynamic creative hub with new opportunities for rich and diverse cultural works and events for public enjoyment. A series of stairs, external lifts and balconies designed as a contemporary interpretation of the original gantries reflecting the precincts former industrial heritage; and modification to the roof. Redevelopment plans for Walsh Bay not only celebrate the unique heritage value of Pier 2/3 and Wharf 4/5, they commit to their preservation and longevity. The Walsh Bay Wharves were constructed in the 1920’s and considered the ‘jewel in the crown’ of extensive harbour-side redevelopment in Sydney. They were thought highly-innovative structures and subsequently catered to international shipping for many years. In 1983 the precinct was reinvigorated and became home to Sydney Theatre Company. 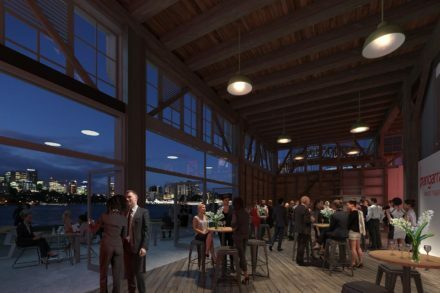 This latest redevelopment will restore the industrial character of the wharves while also creating new and enhanced facilities in support of arts and culture. Infrastructure NSW (INSW) is responsible for managing the construction process and have signed a contract with Richard Crookes Constructions whilst ensuring the project is delivered in a timely manner. Stage One of the Walsh Bay Arts Precinct redevelopment has begun. Demolition will begin immediately. Wharf 4/5 will be closed to the public and pedestrians will need to use the Hickson Road footpath to access Pier 2/3. The project is being delivered in two stages. Stage One work includes demolition and strip out of existing internal facilities inside Wharf 4/5 and ongoing investigation work in Pier 2/3. Stage Two includes detailed fit out work to both Pier 2/3 and Wharf 4/5. Infrastructure NSW invites the local community to attend a consultation session on 10 October to meet the project team, discuss the work and explain any changes (such as access routes) that will take place during the construction period. Please email walshbayinfo@infrastructure.nsw.gov.au or call 1800 679 121 if you would like to attend. If you would like to meet with the project team to discuss construction impacts or changes to the precinct, please email walshbayinfo@infrastructure.nsw.gov.au or call 1800 679 121. Until completion of the Walsh Bay Arts Precinct in 2020, our resident companies can be found at the following addresses and websites. The redevelopment of the WBAP is being led by Create NSW Infrastructure and supported by INSW. Create Infrastructure maintains responsibility for the strategic and design outcomes and managing stakeholder and community relations, while INSW is responsible for preparing the State Significant Development Application (SSDA) and ensuring the project is delivered in a timely manner. Award winning architectural firm Tonkin Zulaikah Greer (TZG), who have also worked on the refurbishment of Customs House, Carriageworks and the Sydney Opera House renewal, was appointed in March 2016 and the project architects. TZG is working closely with Create Infrastructure and the arts tenants during the refinement of the design.